After 15 years of very part-time use of this golf community second home, the couple had decided to make some changes. To start, they decided to split their time evenly between Scottsdale and their primary residence in Tahoe when they retired. The Desert Mountain house had been built in the ‘90s. Mike and Colleen had purchased it furnished in fairly bland colors and … Colleen felt that the master closet was too small. It was time for some upgrades. Creating a larger, more luxurious closet involved a renovation that added more space to other areas as well, but that was only the beginning of the interior changes. Throughout the property, Mike and Colleen wanted more of an indoor-outdoor connection. To accomplish this, the living room got large glass doors that could open completely into “pockets” so they are concealed. The couple and their guests can now step out onto the new patio, which overlooks the golf course. There would be changes to the exterior, too, with some of the same materials added there incorporated into the living room fireplace as well. The original exterior had been very light, almost white, so it stood out too much in the Arizona landscape. With the addition of regionally sourced stacked stone and a softening of the exterior colors, the home blends more into the site and environment. 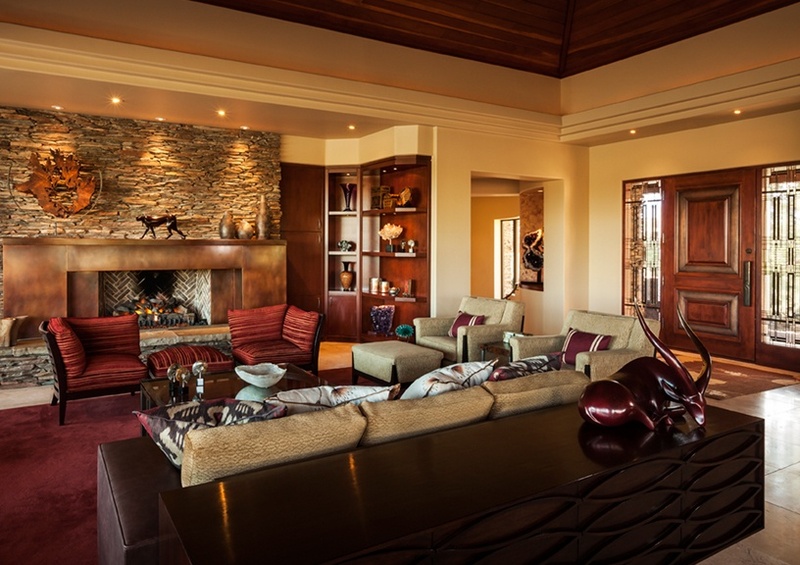 In the living room, around the stone of the fireplace, that favored Arizona metal, copper, gives a local feel and enhances the outdoor-indoor connection. All of the finishes on the inside got updates as well, with new furnishings in the living room, dining room, master bedroom, his office and her office. Mike and Colleen wanted color – red, purple, teal.